We tried making this dish for the first time for Mama's Birthday Party. 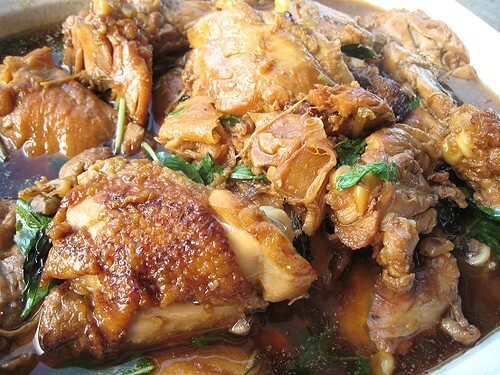 Theoretically, the"three cups" in Three-Cup chicken are of sesame oil, soy sauce and wine. Of course, theory is quite different from practice. First off, browning the chicken. After that, it was basically our favorite genre of dish: the dump-everything-into-a-pot-and-wait kind. A light sauteing of ginger and garlic, and in went the chicken pieces, followed by 1:1:1 of sesame oil, soy sauce and michiu wine. 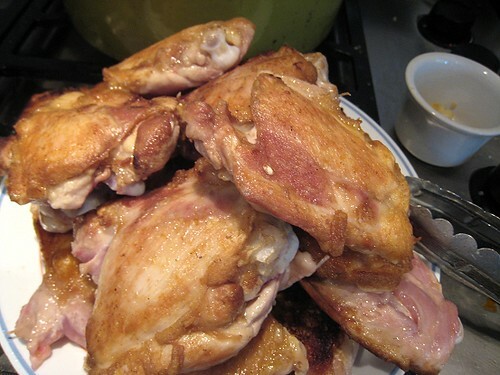 I tasted the braising liquid and found the sesame oil to be too overpowering. I do like sesame oil, but even I almost swooned from the aroma! I tasted and tinkered, tasted and tinkered. I ended up adding more soy sauce and michiu. I also added vinegar (rice wine vinegar, in this case) and sugar. The acidity really helps to cut the overly-unctuous mouthfeel of the sesame oil and add a much needed break from the rich, brown umami nature of the dish. As for the sugar: well, all the San-Bei Jis we've had always had a touch of sweetness to them. The sugar did the trick. I tasted and tinkered until I found the balance of flavors I liked. 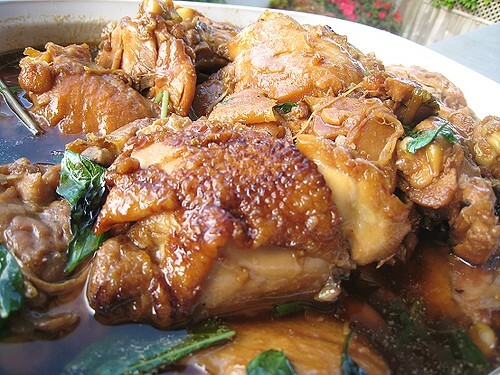 After braising until the chicken pieces were cooked and tender, I added the Thai basil leaves. This is a mandatory ingredient. Needless to say, one must eat this with plain white rice. Otherwise, all that sauce has nowhere to go! The dish will be slightly salty as well, so the rice will balance that nicely. 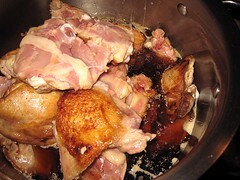 We could have taken the skin off the chicken thighs to lessen the amount of oil that is in the dish. Traditionally, Taiwanese food is quite oily and it is not uncommon to see oil glistening in pools like in the picture below. This classic Taiwanese dish was quite the hit at the party. It is now officially part of our repertoire. Sounds like a good rule of thumb and easy to remember. I thought the sesame oil would be pretty strong but maybe they use the lighter kind from untoasted seeds. I've always wondered about michiu. Picked a bottle up on a whim. Does it go by any other name? Is it white rice wine? Thank you for visiting my blog and leaving a cool message on my Zebra Cake post:) I came to check yours and started getting hungry at the look of this chicken! :) It looks so delicious! You have a great blog! I just subscribed to you. Cheers! Yes, michiu is rice wine. I don't really know too much about it. I don't even know what the difference between michiu and shaoxing wine is. We just have both in the house and we sort of use them "randomly." Ah, good point about the sesame oil. I just used what we had on hand. I believe it *was* the toasted kind. I've put the zebra cake as a "challenge" to our sister-in-law. (She recently took up baking.) So perhaps we will have a zebra cake post soon! I actually basically knew that somehow or other, the 1:1:1 of the three ingredients will be off-balanced. I was actually afraid of the soy sauce more in the beginning. 1/4cup ratio of wine,soy, and sesame oil worked well with 1 tablespoon of rice vinegar. I find that reducing the chicken for a long period of time on low heat (30-40mins) brings out a nice dark color, and makes it super delicious. I must be blind but I can't find the ratio of wine to soy sauce to sesame oil in the post. Could you share that? Traditionally, it's one part each (1:1:1). 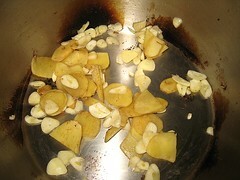 However, the sesame oil is quite strong, so perhaps one should halve the amount if that ingredient. Adding a touch of vinegar and sugar also helps balance everything out.